Ages 5 through 14. Help children learn to use precise vocabulary and basic concepts related to size, color, shape, quantify, and location as they identify similarities and differences, describe word relationships, and answer questions requiring them to make comparisons or to give precise, specific responses. 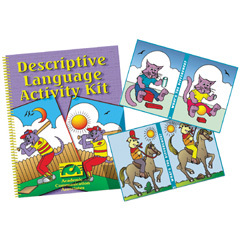 The complete kit includes 24 full-color What's the Difference Cards and an activity manual with reproducible worksheets.